Lex Luthor may have turned his back on Circe and Ra's Al Ghul (as seen in Trinity #7) but they are still intent on destroying the Trinity. Ra's with slight arrogance incorrectly deduces that the Trinity exists because of their strength in numbers. Circe points out if that they are part of a pantheon in the form of the Justice League and that is fate that is at the core of their bond. Right now they are less a Trinity themselves and Ra's questions their strength and influence now that Luthor has abandoned them, but Circe is confident in their path despite their dwindling number. Conjuring the power of the Pandora Pits, Circe hatches a plan to create a great disaster, one that involves Jason Blood and splitting him from his Demon! Etrigan completely free of his figurative shackles wastes no time ravaging the Greek isles as Jason slowly begins to age and die. Enter the Trinity, on a mission to save civilians, defeat the demon and reunite Etrigan with his human tether. Who will win, the Trinity or their Unholy reflection, and what do Bizarro, Red Hood and Artemis have to do with the future of both their fates? Story - 5: I don't know about you but this was a story I was waiting for. I loved everything about Trinity #7 except when #8 was released and left so many unanswered questions - so this was like Christmas come early. We finally follow up on the threads dangling from that superb issue. I'm not sure about Etrigan being the weapon of choice but with the story focusing on the theme of 'fate' and destiny I guess he fits in neatly, but honestly? I was hoping the Composite Trinity would have been Circe's weapon of choice - maybe they're saving him/her/it for a different destiny. Comixology hinted at a different direction in the Annual's blurb, one that if it were true would really mess with continuity and leave Lex Luthor fans very unhappy. Overall it was a great story that worked to each individual's strength and I'm really excited that the Unholy Trinity are going to continue. Art - 4: Forty-ish pages of some superb artwork. The inking could have been less frenetic as it made some of the scenes feel rushed. Over all the layouts were strong, with Circe standing out in particular. The facial expressions were especially confident. 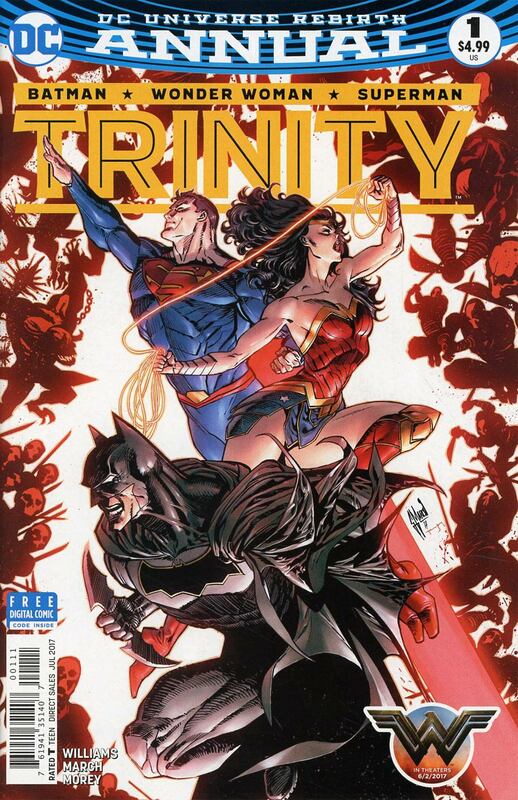 The only other downside is that the Trinity weren't given time to shine compared for example to when Francis Manapul launches into those huge showcase pages. I've been spoilt on this title clearly! Cover Art - 3: The ingredients are there, Superman, Wonder Woman and Batman each have what appears to be a stock pose, that separately would work but when they are put together it feels almost like one of those reusable sticker scene kits we used to have as kids. The inking again is opting for a sense of urgency and to be honest it didn't need to be. I wish the cover did justice to the story inside.